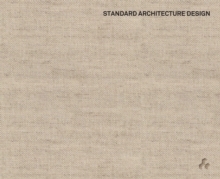 Through an in-depth exploration of nine projects ranging from retail to residential design, Standard Architecture Design highlights the practice of Los Angeles-based interdisciplinary studio Standard while it deconstructs traditional conceptions of interior and exterior space.By honing in on the malleability of the storefront and its transformative role across varying sectors of architecture and design, Standard presents an alternative understanding of the facade. The public/private divide becomes permeable, and cultural narratives can be written from the inside out-flowing from fundamental elements like space and light to the contextual meaning of place. In Standard's world, transitional spaces such as doors, windows and openings come to define and bring meaning to our collective experience of place.From nooks like Hidden House and Kayne Griffin Corcoran that escape their immediate surroundings to the hybrid retail-gallery venues such as the Helmut Lang Concept Store and Maxfield Gallery in West Hollywood, Standard unveils the studio's unique philosophy in action.Across all of Standard's work is the feeling of osmosis through space and time: where old sites bleed into new structures, and apparently contrasting elements of urban life are artfully exposed to one other, re-producing themselves in the process. The result is a sophisticated rendering of place that is at once as intimate as it is accessible, and as nuanced as it is organic.